Is 540 horsepower (and 510 lb-ft of torque) sent to a live rear axle enough to constitute monarchical sovereignty over all thoroughfares? 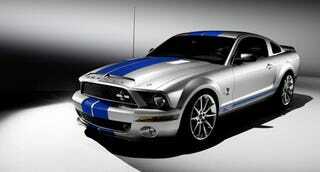 You make the call, we'll make with the specs on the 2008 Ford Shelby GT500KR. The name recalls one of the last Shelby Mustangs to be produced during the late 1960s. This King comes with a six-speed manual and a rear axle ratio of 3.73:1. It gets the Ford Racing power package, which includes a modified ECU and cold-air intake; performance suspension including stiffer springs, dampers, and stabilizer bars; Shelby-designed 18" wheels (20" for show purposes); short-throw shifter and front strut tower brace; carbon composite hood featuring classic Shelby 'KR' design, and front brake cooling ducts. We'll see it at the New York auto show next week ahead of its arrival next spring for a run of 1000 units.